While email service providers like Google have by and large figured out how to tackle the nuisance of spam, the problem is far from solved on the mobile front. In spite of the exponential increase in the processing power and sophistication of smartphones, no one has managed to crack the problem of automatically detecting and filtering call and message SPAM. If you want respite from SPAM, your best bet is to signup for the National Do Not Call (or Do Not Disturb) registry. Adding your mobile number to the DNC/DND list is simple and hassle free. All you need to do is to call 1909 and follow the instructions. In my experience, this gets rid of over 90% of unwanted calls and messages. Unfortunately, not every one adheres to the DND list. In spite of strict punishment prescribed by TRAI (Telecom Regulatory Authority of India), lots of unscrupulous telemarketers ignore the DND list. Fortunately, you can fight back against these spammers by ensuring that they’re punished. TRAI allows users to lodge complaints by forwarding the SMS to 1909 along with the phone number and date. However, manually reporting SMS and Calls in the TRAI prescribed format is too cumbersome for most users. Realizing this, Deepak Jharodia from Noida has developed an Android app to simplify the process. The app is aptly called “India Against Spam”. India Against Spam is not particularly beautiful or elegant. However, it’s easy to use and gets the job done. The app lists all your SMS messages and recently received calls. 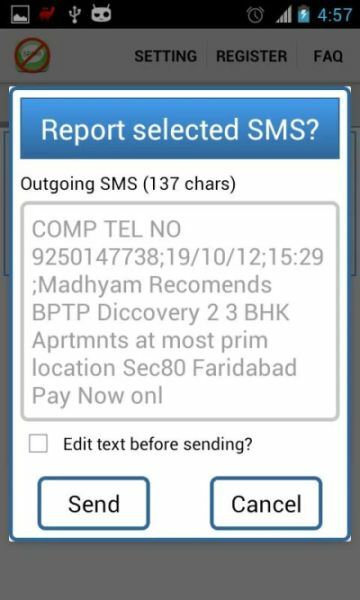 All you have to do is select the offending entry, and the app will automatically create a report and submit it to TRAI. The number 1909 is toll free, so you won’t be charged for reporting spam SMS and calls. Once you’ve registered a report, you’d get followup messages letting you know your complaint number and the status of your complaint.